1) SCP-1524-1 is to be stored in Site ██, or an equivalent parking facility designed for the containment of anomalous vehicles, with its fuel tank completely drained. Five kilograms of grass clippings must be placed in SCP-1524-1's rear compartment per day. Access to the vehicle's storage area is restricted to personnel with class 2 security clearance and above. Any instances of SCP-1524-2 beyond the first that are produced by SCP-1524-1 are to be destroyed upon discovery. 2) SCP-1524-2 is to be held in a standard humanoid containment chamber near the site containing SCP-1524-1, with water and simple meals provided twice per day. A recording of a broadcast from the Seattle, WA based radio station KMPS (94.1 FM) must be kept playing at all times within the enclosure of SCP-1524-2. While it has not demonstrated the ability to speak or understand human speech, supervisors are discouraged from speaking or otherwise interacting with it. If the need arises to transport SCP-1524-2 between facilities, vehicles bearing any resemblance to SCP-1524-1 must not be used. A Foundation-approved vehicle will be designated for this purpose if the need arises. Continuous exposure to KMPS broadcasts must be maintained at all times. 3) All tools and other non-organic implements found in SCP-1524-1 may safely be kept in standard storage lockers. Under no circumstances should any of SCP-1524's component parts be allowed to interact with one another except in a controlled testing environment. Description: SCP-1524 is the sole remaining specimen of a species of modular organisms discovered in ██████, WA that take the form of a small, locally-owned landscaping business called "Freddy Sanchez Super Service Care Lawn". Each specimen of SCP-1524 consists of a human-like entity (presumably named "Freddy Sanchez") with the appearance of a middle-aged Latino male, and a large, white utility van of indeterminate manufacturer and model. 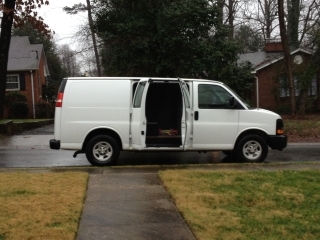 The van (SCP-1524-1) appears to contain the central nervous system and digestive tract of SCP-1524. Within the rear compartment is a large, humid cavity of gray organic tissue that maintains a constant temperature of 24 degrees Celsius. This area serves as SCP-1524's stomach, though it also has the function of storing gardening implements such as pinking shears, rakes, and a lawn mower. SCP-1524's humanoid "passenger" (SCP-1524-2) was grown directly from the driver seat of SCP-1524-1, serving as the van's limbs and sensory organs. Scans have revealed that it has a small secondary brain encased in a thick membrane within the head, and that there are no other recognizably human systems within the body; instead the abdominal cavity is filled with the same gray organic tissue present inside SCP-1524-1. Because of its lack of an internal skeleton, it walks with wave-like lurching motions, somewhat like those of an earthworm. Though vastly different in form and function, SCP-1524-1 and SCP-1524-2 are a single organism. SCP-1524-2 is believed to absorb nutrients directly from the seats of the van, but can also sustain itself with ingested organic material if necessary. Though no neural link exists between the two components while they are separated, SCP-1524-1 exerts control over its humanoid component through local radio broadcasts played through its built-in stereo, with different stations inducing specific behaviors in SCP-1524-2, including scouting, gathering food, defending against perceived threats, and initiating reproduction. The country music station KMPS puts SCP-1524-2 in a trance-like passive state, during which it will not attempt to defend itself or reunite with the vehicle, and is therefore recommended for use in SCP-1524's containment. The primary function of SCP-1524's human component appears to be harvesting plant material, which it gathers under the guise of performing landscaping work, then brings back to SCP-1524-1 where it is broken down into nutrients. It also serves as SCP-1524's reproductive system, as demonstrated by the multiple different specimens present at the site of recovery and the unfortunate ███████████ of Agent Onno. Upon hearing the station identification of the radio station KZOK (102.5 FM), SCP-1524-2 will enter a state of agitation, during which it will seek out a host. When a viable target is encountered, SCP-1524 will [DATA EXPUNGED]. Attempts to reverse this process have been unsuccessful, as all original tissue is destroyed upon conversion, though the vehicular component retains much of its original functionality and framework. As SCP-1524's origins and purpose (if any) are unclear, it is currently believed to be in the Foundation's best interests to prevent further instances from being created.